To explore the relationship between demographics, satisfaction with specific aspects of life and overall life satisfaction, we used a statistical technique called multivariate regression, which allowed us to test the individual impact of a number of factors on life satisfaction while holding other variables constant. We ran a multilevel, mixed effects, multivariate regression on all countries pooled (see here for full results), but found similar results when estimating the regression in each country separately. We analyzed two models: one that includes demographics only and one that includes satisfaction with various aspects of life and demographics. Overall, we find that economic factors, including income, number of key household goods and satisfaction with standard of living, have the biggest impact on individual happiness. Education, gender, marital status and employment as well as satisfaction with family, friends and health also matter, though to a lesser degree. 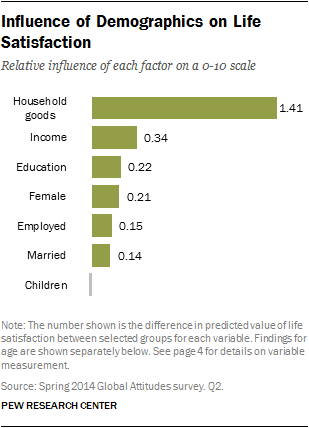 In our first model with just demographics, we find that the number of key household goods a person owns from a list of nine items has the greatest influence on individual life satisfaction. The survey asked respondents whether their household had in working order each of the following nine items – television, refrigerator, washing machine, microwave oven, computer, car, bicycle, motorcycle/scooter and radio. A person who owns none of the nine household items has a predicted overall life satisfaction of 5.55 points on a 0-10 scale. A person who reports owning all nine items has a predicted satisfaction of 6.96, a difference of 1.41 points. 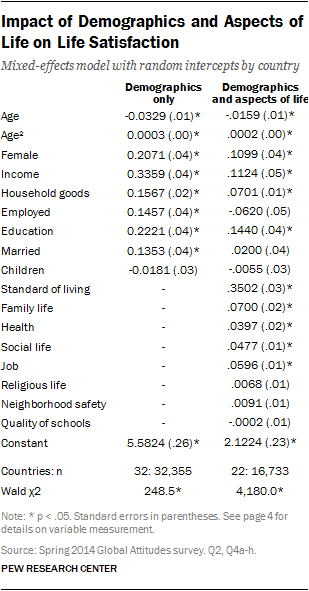 In addition to possessions, income (+0.34 points), education (+0.22), and being a woman (+0.21), employed (+0.15) or married (+0.14) all have a significant, positive impact on happiness (see page 4 for details on variable measurement). Having children under the age of eighteen living at home does not significantly impact life satisfaction. Age also has a significant influence on happiness, controlling for other demographics. 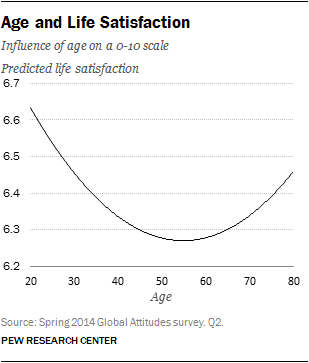 As people approach middle age, they are less content with their lives than younger individuals, hitting their lowest point in their 50s, with a predicted level of satisfaction of 6.28 for a decrease of 0.36 relative to a 20 year old. As they reach 75, predicted happiness increases 0.11 points to 6.39. Our second model demonstrates that, alongside demographics, happiness with specific aspects of individuals’ lives influences their overall satisfaction. Economic, rather than personal, factors have the greatest influence on happiness, even when controlling for individual finances. A person who rates their standard of living low on a 0-10 scale (at the global 25th percentile) has a predicted overall life satisfaction of 5.79. An individual who is highly satisfied with their standard of living (at the global 75th percentile) has a predicted life satisfaction of 6.84 – a difference of 1.05 points. Satisfaction with their job (+0.24), family life (+0.21), social life (+0.14) and health (+0.12) also has a positive – though smaller – impact on overall well-being. Happiness with neighborhood safety, religious life and local schools does not have a statistically significant effect on individual happiness. When accounting for satisfaction with aspects of life, most demographic characteristics remain significant, including income and possessions. Marital and employment status, however, are no longer key predictors of satisfaction. The results reported are based on a weighted, linear mixed-effects model with random intercepts by country and standard errors clustered by country. In addition to the mixed-effects model, we also estimated an ordinary least squares (OLS) regression with country dummy variables, survey weights and clustered standard errors, and an OLS regression with country dummy variables that accounted for the complex survey design of the data. All models provided similar coefficients and significance tests, though the standard errors in the approach we ultimately used were generally the most conservative. Alongside these pooled models, we evaluated the robustness of the results by estimating the models for each country separately. These country-specific models yielded similar conclusions. The dependent variable is life satisfaction, measured on an 11-point scale. Respondents are asked to place themselves on a ladder, where the top of the ladder (10) represents the best possible life for them and the bottom represents the worst possible life (0). For this analysis, the ladder variable is treated as continuous and people who responded “Don’t know” or “Refused” are excluded. 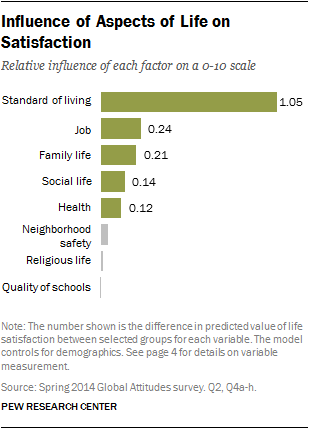 Satisfaction with areas of life: Respondents were asked to rate their level of satisfaction, where 0 means very dissatisfied and 10 means very satisfied, with each of the following areas of their lives: standard of living, family life, health, social life, present job, religious life, neighborhood safety and quality of local schools. Argyle, Michael. “Causes and Correlates of Happiness.” Well-being: The foundations of hedonic psychology. Eds. Daniel Kahneman, Ed Diener, and Norbert Schwarz. New York: Russell Sage Foundation, 2003. 353-373. Blanchflower, David G. and Andrew J. Oswald. “Is well-being U-shaped over the life cycle?” Social Science & Medicine 66.8 (2008): 1733-1749. Cantril, Hadley. The Pattern of Human Concerns. New Jersey: Rutgers University Press, 1965. Diener, Ed, et al. “The relationship between income and subjective well-being: Relative or absolute?” Social Indicators Research 28.3 (1993): 195-223. Dolan, Paul, Tessa Peasgood and Mathew White. “Do we really know what makes us happy? A review of the economic literature on the factors associated with subjective well-being.” Journal of Economic Psychology 29.1 (2008): 94-122. Easterlin, Richard A. “Does economic growth improve the human lot? Some empirical evidence.” Nations and Households in Economic Growth 89 (1974): 89-125. Easterlin, Richard A. “Explaining happiness.” Proceedings of the National Academy of Sciences 100.19 (2003): 11176-11183. Glenn, Norval D. and Charles N. Weaver. “A note on family situation and global happiness.” Social Forces 57.3 (1979): 960-967. Graham, Carol. “The economics of happiness: Insights on globalization from a novel approach.” World Economics 6.3 (2005): 41-55. Graham, Carol. Happiness around the world: The paradox of happy peasants and miserable millionaires. New York: Oxford University Press, 2009. Nomaguchi, Kei M. and Melissa A. Milkie. “Costs and rewards of children: The effects of becoming a parent on adults’ lives.” Journal of Marriage and Family 65.2 (2003): 356-374. Stevenson, Betsey and Justin Wolfers. “Economic growth and subjective well-being: Reassessing the Easterlin paradox.” No. w14282. National Bureau of Economic Research, 2008.